The force with which blood pumps from the heart to the arteries is known as blood pressure, and a normal blood pressure reading should be equal to or less than 120/80 mm Hg. High blood pressure, also known as hypertension, means that the blood is flowing more forcefully through your arteries which increases the pressure on them and in turn causes damage to them. High blood pressure is a serious health problem that can lead to heart failure, strokes or even kidney failure. If the blood pressure reading is 140/90 mm Hg or above, then it is considered to be high. What symptoms can be taken as warning signals for severe hypertension? What is the prescribed course of action in case they occur? Should a person be worried if he has high blood pressure, but still feels fine? How often should a person check his blood pressure? Why is honey considered beneficial for high blood pressure? Please provide some tips regarding high blood pressure. How can we know that our high blood pressure is beyond the scope of home treatment and requires medical help? 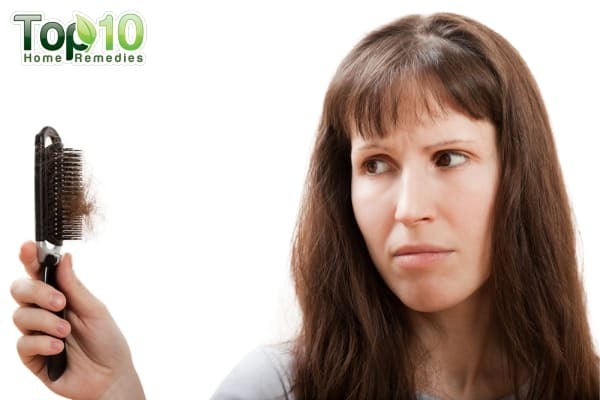 What is the fastest way to bring down elevated blood pressure levels naturally and at home? What are the ideal drinks for relieving mild to moderate hypertension? Is smoking conducive to high blood pressure? If so, how? What role does sleep play in managing blood pressure levels? When your heart beats, it squeezes blood into the arteries and creates pressure. 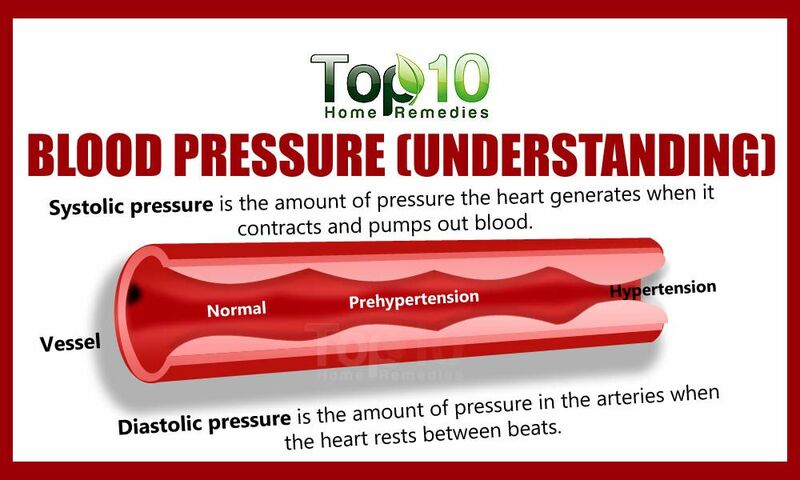 The systolic pressure or top number represents the heart’s force of moving the blood into those arteries. Between beats, the heart is at rest while it refills with blood. The diastolic pressure, or bottom number, measures the pressure in the arteries while the heart is resting. The American College of Cardiology, in 2017, lowered the numbers for the diagnosis of hypertension to 130/80mm Hg and higher for all adults. The new guidelines are made to bring more people into the hypertensive range to favor the pharma companies to make more money. High blood pressure is called the “Silent Killer” because it often has no warning signs or symptoms, and many people do not know they have it. But these signs and symptoms aren’t specific and usually don’t occur until high blood pressure has reached a severe or life-threatening stage. 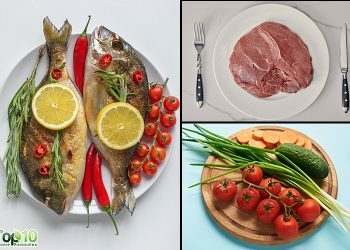 Healthy Diet: Eat a healthy diet by limiting the amount of salt and increasing the amount of potassium. Also try to include plenty of fruits, vegetables and whole grains in your diet. Regular Exercise: Exercise regularly as it would help you maintain a healthy weight and lower your blood pressure as well. Maintain Healthy Weight: Being overweight or obese increases the risk of high blood pressure so try to maintain a healthy weight. A healthy weight would also reduce the risks of other health problems for you. Drink Less Alcohol: Limit the amount of alcohol you drink in a day to 2 drinks per day in case of men and 1 in case of women. Quit Smoking: Quit smoking, as it not only raises your blood pressure but also puts you at risk for cancer, heart attack, and stroke. Manage Stress: Try to relax and manage your stress to improve your emotional and physical health. Sleep Well: Sleep for 7 to 9 hours per day. Reduce Saturated Fats: Decrease the intake of saturated fats and cholesterol. If you notice your blood pressure in the pre-hypertension range, then consult your doctor and work with him/her to take steps to bring it down. The treatment plan would include medication, changes in your lifestyle or therapies. If your blood pressure reading is 130/88 mm Hg or above, or if instead of stabilizing or lowering, your blood pressure keeps rising despite following any of the below remedies, then visit the doctor immediately. Regularly monitor your blood pressure either at home or visit the doctor to monitor is recommended. You would need immediate medical attention in case of constantly high blood pressure reading. 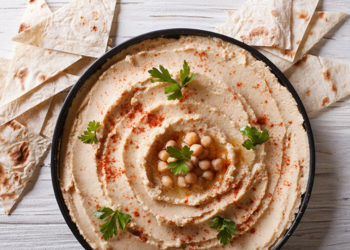 Here are 10 food-based home remedies for high blood pressure. Lemons help decrease rigidity from blood vessels by keeping them soft and pliable. This, in turn, helps reduce the blood pressure. In addition, lemons also help lower your chances of heart failure due to their vitamin C content. Vitamin C is an antioxidant that helps neutralize the harmful effects of free radicals. Simply drink a cup of warm water with the juice from half a lemon added to it each morning on an empty stomach. For best results, do not add salt or sugar. 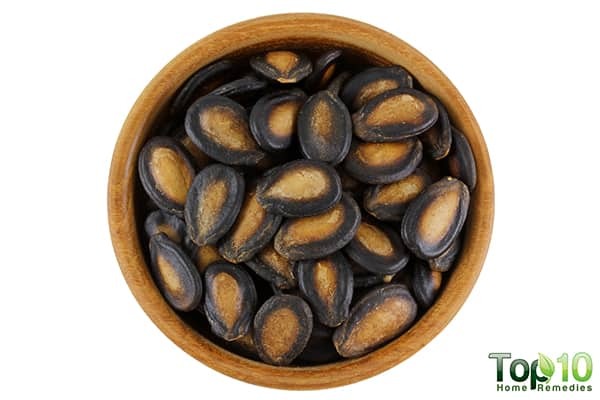 Watermelon seeds contain a compound called cucurbocitrin, which helps widen the blood capillaries. This compound also helps improve kidney functioning, which in turn reduces blood pressure levels and also helps a lot with arthritis. A pilot study published in the American Journal of Hypertension in 2011, reports that watermelon helps lower the blood pressure due to its vasodilatory effect. Add 2 teaspoons of gently crushed, dried watermelon seeds to 1 cup of boiled water. Steep it for about an hour, then strain it. Take 4 tablespoons of this water at regular intervals throughout the day. 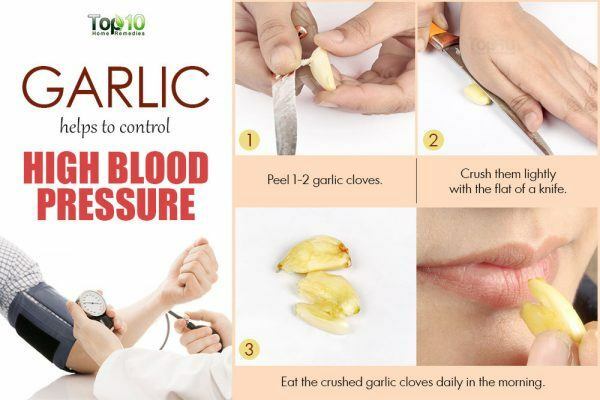 Several studies have demonstrated blood pressure lowering effects of garlic. Garlic (both raw and cooked) helps control high blood pressure and at the same time reduce cholesterol levels. Garlic helps relax blood vessels by stimulating the production of nitric oxide and hydrogen sulfide. Eat 1 or 2 crushed garlic cloves daily. You can simply crush them with your hands. Crushing garlic cloves creates hydrogen sulfide, a compound that promotes good blood flow, removes gas and reduces the pressure on the heart. If you do not like eating raw garlic or if it causes a burning sensation, then take it along with a cup of milk. You can also mix 5 or 6 drops of garlic juice in 4 teaspoons of water and take it twice a day. 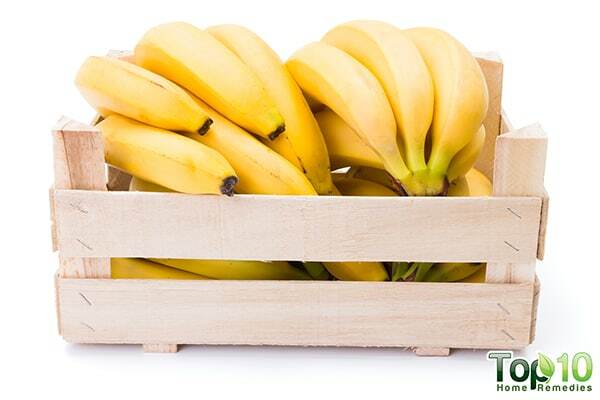 Eating bananas regularly help people with high blood pressure control it. Bananas are a rich source of potassium, which lessens the effect of sodium. So, try to eat 1 or 2 bananas daily. Along with bananas, you can try dried apricots, raisins, currants, orange juice, spinach, zucchini, baked sweet potatoes, cantaloupe, and winter squash. The high level of the phytochemical 3-N-butylphthalide present in celery greatly helps control high blood pressure. Phthalides help relax the muscles in and around arterial walls, thereby creating more space and allowing the blood to flow in without difficulty. At the same time, it can help reduce the stress hormones that constrict blood vessels, which contributes to high blood pressure. 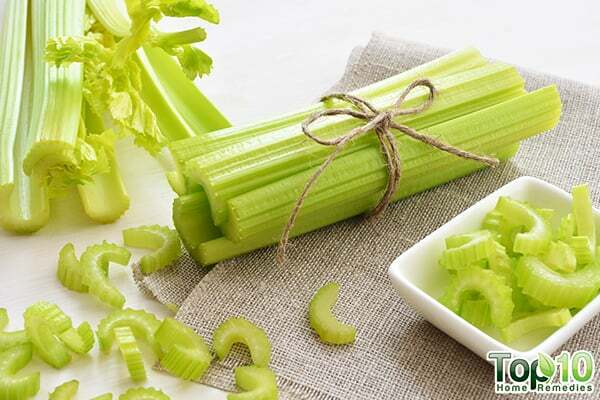 Try to eat 1 stalk of celery along with a glass of water daily. If you prefer, you can munch on celery throughout the day. People with high blood pressure must keep their bodies well hydrated. Drinking 8 to 10 glasses of water every day is a good idea. 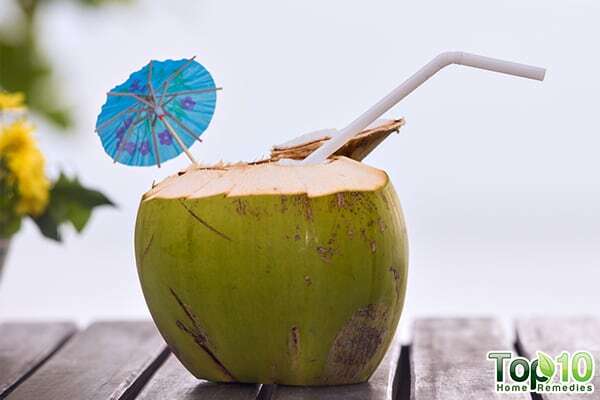 Coconut water is particularly beneficial for lowering systolic blood pressure. A 2005 study published in the West Indian Medical Journal found that coconut water, being rich in potassium, magnesium and vitamin C can help decrease systolic blood pressure. Along with coconut water, you can also use coconut oil when cooking. 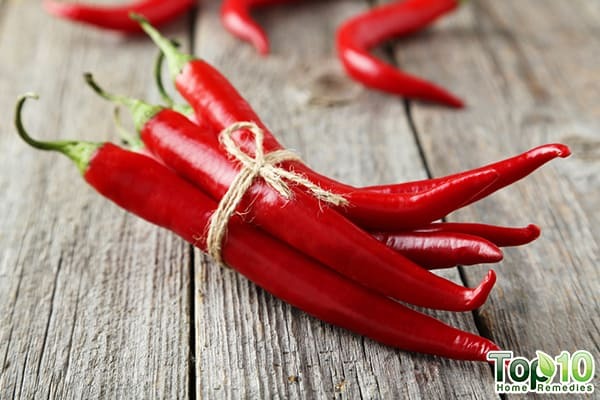 Those suffering from mild hypertension can benefit from eating cayenne pepper. It facilitates a smooth blood flow by preventing platelets from clumping together and accumulating in the blood. You can add some cayenne pepper to fruit or vegetable salad, or add a pinch to a bowl of soup. Because cayenne pepper is quite spicy, you need to use only a little bit. 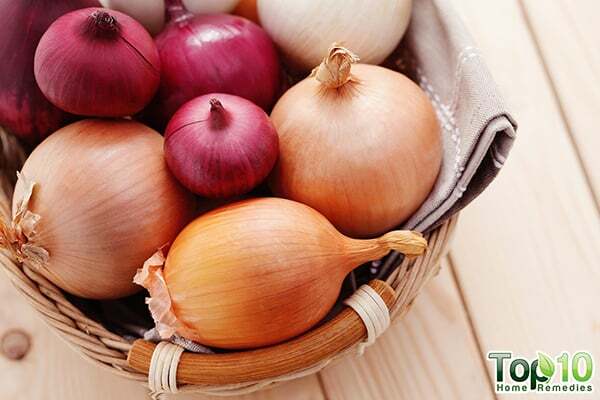 Onions have also been found to lower your blood pressure due to the presence of an antioxidant flavonol called quercetin. Try to eat 1 medium-sized, raw onion daily. You can also mix a ½ teaspoon each of onion juice and honey and take it twice a day for 1 to 2 weeks. 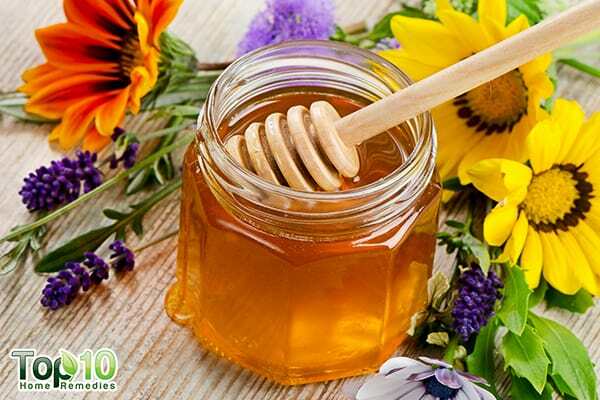 Honey not only reduces pressure from the heart, but it also has a calming effect on blood vessels. Hence, it can be quite helpful in reducing high blood pressure. Consume 2 teaspoons of honey on an empty stomach each morning. You can also mix 1 teaspoon each of honey and ginger juice with 2 teaspoons of cumin seed powder. Eat it twice a day. Another effective remedy is to mix basil juice and honey in equal amounts and have it on an empty stomach daily. 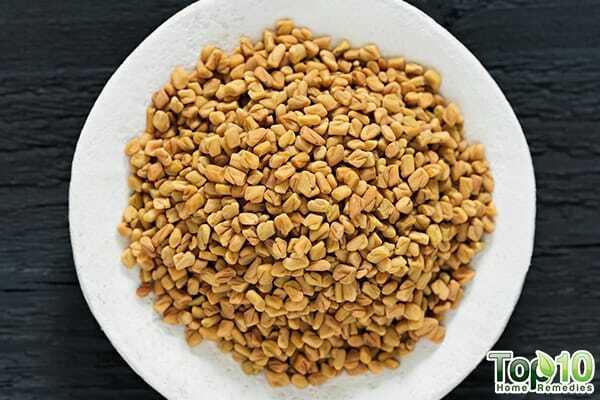 Fenugreek seeds have shown anti-hypertensive effects due to their high potassium and dietary fiber content. Boil 1 to 2 teaspoons of fenugreek seeds in water for about 2 minutes, and then strain it. Put the seeds in a blender and mix it into a paste. Eat this paste twice a day, once in the morning on an empty stomach and once in the evening. 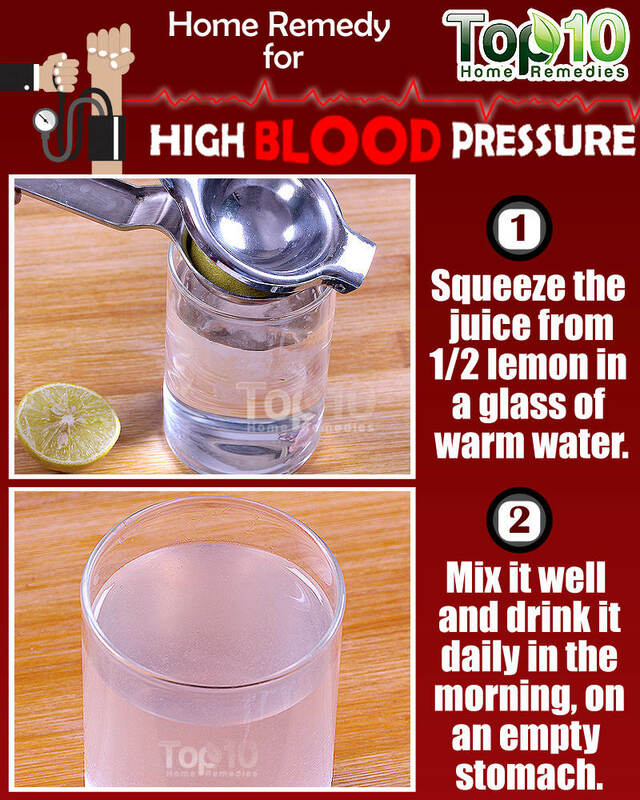 Follow this remedy for 2 to 3 months to notice a significant improvement in your blood pressure level. 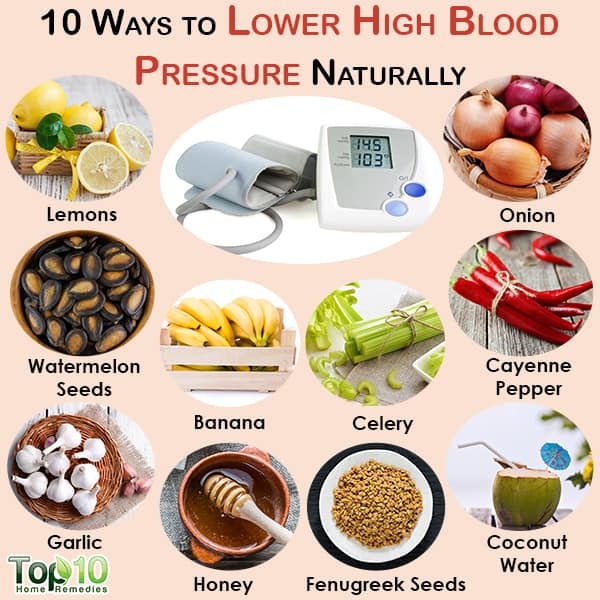 In addition to using these natural remedies as part of treatment for high blood pressure, it is essential to follow your doctor’s medical and dietary advice and go for regular check-ups. Shortness of breath, chest tightness, headache, nausea, and vomiting, are all probable indicators of dangerously high blood pressure. Severe hypertension can lead to stroke or heart attack. If you have any of the symptoms I have listed above, severe hypertension with blood pressure greater than or equal to 180/90, go to an emergency room immediately. Yes, you can have high blood pressure and no symptoms. High blood pressure is often called the “silent killer.” If your blood pressure reading is at or greater than 130/80, it is considered to be in the high range. Persistently elevated blood pressure is a risk factor for heart attack and stroke, and can even cause heart failure if left untreated. A healthy person without high blood pressure is recommended to get his/her blood pressure evaluated during their annual physical examination. People who are prone to high blood pressure, however, require more frequent medical visits and the doctor may even recommend a home blood pressure monitoring schedule. Honey is thought to be helpful because it contains antioxidants. However, it may not be enough to lower blood pressure. I recommend a combination of diet and exercise to lower blood pressure. Additionally, the use of healthy lifestyle changes along with medication to lower blood pressure. Besides, many people with high blood pressure also have a diabetes problem, which makes honey an unsuitable choice for treating their condition. Reduce salt in the diet, don’t add salt to food and swear off processed foods. Increase your intake of potassium-containing foods oranges, bananas, apricots. DASH diet which includes fruits, vegetables whole grains, low-fat dairy products, and healthy proteins, is known to lower blood pressure. These foods have minerals and antioxidants that relax blood vessels leading to lower blood pressure. A 5-pound weight loss can help bring down elevated levels of blood pressure to a small degree. Aerobic exercise: Walking, jogging, cycling, dancing can prove helpful in lowering blood pressure. Reducing stress: Meditation has been found to lower mild to moderately elevated blood pressure. If the blood pressure is persistently elevated despite healthy changes described above. If blood pressure is very high, it should not be treated at home. People should work with their doctor to make the best recommendations to lower blood pressure. There are no drinks that lower blood pressure. Keep alcohol intake low, one drink a day for women or up to two drinks daily for men. Cut back on soda as it can lead to weight gain, a contributing factor for high blood pressure. Smoking causes spasm or tightening of your blood vessels, thereby raising blood pressure. Sleeping less than 7 hours per night leads to high blood pressure and weight gain. Higher blood pressure and weight gain are caused by the increase in stress hormones that are released due to lack of sleep. About Dr. Goldberg: She is the Medical Director of the Joan H. Tisch Center for Women’s Health at the NYU Langone Medical Center. She is also the Clinical Associate Professor of Medicine at the NYU School of Medicine and the Co-Medical Director of the 92nd Street Y’s Cardio Rehab Program. She also hosts a radio show on Doctor Radio SIRIUS XM 81 of “Beyond the Heart.” Dr. Goldberg is a national spokesperson for the American Heart Association and has started the “Go Red for Women” campaign. Whelton PK, Carey RM, Aronow WS, Casey Jr. DE, Collins KJ. Guideline for the Prevention, Detection, Evaluation, and Management of High Blood Pressure in Adults. Journal of the American College of Cardiology. http://www.onlinejacc.org/content/71/19/e127. Published May 2018. 2017 Guideline for High Blood Pressure in Adults. American College of Cardiology. https://www.acc.org/latest-in-cardiology/ten-points-to-remember/2017/11/09/11/41/2017-guideline-for-high-blood-pressure-in-adults. Re RN. Obesity-Related Hypertension. Ochsner Journal. http://www.ochsnerjournal.org/doi/full/10.1043/1524-5012-9.3.133. Kurtz TW, DiCarlo SE, Pravenec M, Morris Jr. The American Heart Association Scientific Statement on salt sensitivity of blood pressure: Prompting consideration of alternative conceptual frameworks for the pathogenesis of salt sensitivity? Journal of Hypertension. https://www.ncbi.nlm.nih.gov/pubmed/28650918. Published November 2017. Kato Y, Domoto T, Hiramitsu M, et al. Effect on Blood Pressure of Daily Lemon Ingestion and Walking. Journal of Nutrition and Metabolism. https://www.hindawi.com/journals/jnme/2014/912684/. Published April 10, 2014. Figueroa, A.Perkins-Veazie M, M. P, H. B. Effects of Watermelon Supplementation on Aortic Blood Pressure and Wave Reflection in Individuals With Prehypertension: A Pilot Study | American Journal of Hypertension | Oxford Academic. OUP Academic. https://academic.oup.com/ajh/article/24/1/40/2281929. Published January 1, 2011. Ried K, Frank OR, Stocks NP. Aged garlic extract reduces blood pressure in hypertensives: a dose–response trial. Nature. 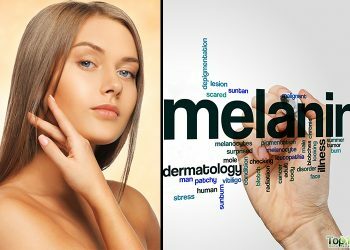 https://www.nature.com/articles/ejcn2012178. Published November 21, 2012. Ried K. Garlic Lowers Blood Pressure in Hypertensive Individuals, Regulates Serum Cholesterol, and Stimulates Immunity: An Updated Meta-analysis and Review. The Journal Of Nutrition. https://www.ncbi.nlm.nih.gov/pubmed/26764326. Published February 2016. Cappuccio, GA MG. Department of Physiological Medicine, St. George’s Hospital Medical School, London, UK. Health Communication. https://europepmc.org/abstract/med/1649867/reload=0. Published May 1991. Whelton PK. Effects of Oral Potassium on Blood Pressure. JAMA Internal Medicine. https://jamanetwork.com/journals/jama/article-abstract/416446. Published May 28, 1997. Okorie, Eleazu, Nwosu. Nutrient and Heavy Metal Composition of Plantain (Musa paradisiaca) and Banana (Musa paradisiaca) Peels. Journal of Nutrition & Food Sciences. https://www.omicsonline.org/open-access/nutrient-and-heavy-metal-composition-of-plantain-musa-paradisiaca-and-banana-musa-paradisiaca-peels-2155-9600-1000370.php?aid=52304. Published April 27, 2015. Antihypertensive Effect of Celery Seed on Rat Blood Pressure in Chronic Administration. A Definition for Wildness | Ecopsychology. https://www.liebertpub.com/doi/abs/10.1089/jmf.2012.2664. Published June 13, 2013. Alleyne T, Roache S, Thomas C, Shirley A. The control of hypertension by use of coconut water and mauby: two tropical food drinks. West Indian Medical Journal. http://caribbean.scielo.org/scielo.php?pid=S0043-31442005000100002&script=sci_arttext. Published January 2005. Yang D, Luo Z, Ma S, et al. Activation of TRPV1 by Dietary Capsaicin Improves Endothelium-Dependent Vasorelaxation and Prevents Hypertension. Cell Metabolism. https://www.sciencedirect.com/science/article/pii/S1550413110002287. Published August 3, 2010. L. R, Tiffany, Litwin, et al. Quercetin Reduces Blood Pressure in Hypertensive Subjects | The Journal of Nutrition | Oxford Academic. OUP Academic. https://academic.oup.com/jn/article/137/11/2405/4750737. Published November 1, 2007. Erejuwa OO, Sulaiman SA, Wahab MSA. Honey: A Novel Antioxidant. MDPI. http://www.mdpi.com/1420-3049/17/4/4400/htm. Published April 12, 2012. Balaraman R, Dangwal S, Mohan M. Antihypertensive Effect of Trigonella foenum-greacum. Seeds in Experimentally Induced Hypertension in Rats. Taylor & Francis. https://www.tandfonline.com/doi/abs/10.1080/13880200600896538. Published October 7, 2008. I have been on a blood pressure medication since 2 years. I also had a lot of acidity and bloating. I have been having a cup of turmeric tea 1st thing in the morning for over a month. My blood pressure has drastically come down. My acidity and bloating are gone. Put half a teaspoon of turmeric powder in a cup of boiled wate. . Add a quarter tea spoon of honey. Cut a small slice of lemmon or lime. Mix in boiling water. Drink 1st thing in the morning on a empty stomach. You will be amazed with the results. Nice informs.God bless you all.l pray that let the creator perfects everything dats concern his children. He is the great healer. Hi guys!i was diagnose recently for having HBP. I got like 150-90.I was reading your comments and it sound promising!i tried eating banana and garlic and i am hoping tomorrow that i wil have a very positive results!ill be posting my results soon!pls wish me well i need it for my medicals for work…. I started taking lemon and honey last night hope to have Good results. 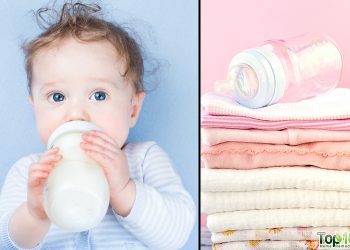 Hi I am Thank I I have one month baby and I am breastfeeding feeding can I also use lemon and honey or garlic will all this not affect my baby. How can someone avoid the offensive smell that comes from eating garlic on a regular basis. Aside from the smell from the mouth, the smell could also come from sweating. Grate ginger root add boiled water, add juice from 1 lemon. Then drink. Long term, move food diet from acid side of food pH side of chart to alkaline side. Thank you so much for the natural remedies. i am starting immediately to try them.From the comments i have noted that it is It is important to also drink lots of water and to exercise and trust in God for the natural remedies to work. I checked my BP yesterday and it read 155/105 took garlic and lemon with water and Honey hope it works by God’s grace. No-one seems to have written for a while, but I wanted to say how friendly everyone seems. I will join you in trying the honey in lemon and see if it works. I have read that beet juice helps lower BP. Has anyone here tried it? The prescription BP meds have ruined my shoulder and thigh muscles and I want to come them once the natural remedies kick in. Thank you to everyone for your helpful advice. Hi, this is From philippines i’d like to share my experience in treating HP try to make old german recipe in treating HP garlic, lemon, honey, apple cider vinegar put in a blender its juice after try to boiled for 15minutes then every morning in empty stomach try to take 1 table spoon of this recipe after 3 days you will fell great it is very effective!!!! Beets and/or Beet juice is NOT recommended for treating HBP, in any case. I hope this helps. This information can be researched. Hello…its today when ive tried to check my BP.it hasbeen 180 by 100 so ive to tyr all the advise ive got from you people. thanks alot. Take 2 cinnamon capsules 1000 mg. each once a day in the morning. It works. My doctor asked me what I was doing to keep my blood pressure down. 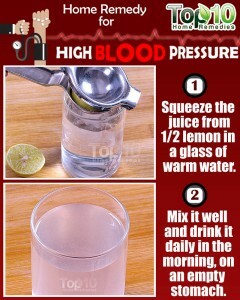 MST often if you have high blood pressure. Its help me and many of my friend those are suffering High BP. I drink lemon juice every morning on an empty stomach but it didn’t reduce BP. I tried Apple Cider Vinegar and it did reduce my BP. Try to drink Apple cider twice a day and it will help reduce the BP.